Take Charge of your BlackBerry Pearl 8100 with Style! One of the things I have always wished my BlackBerry came with was a desktop cradle. Back in the days of Palm handhelds and Windows Mobile devices, I often found the cradle as a great accessory – it looked cool as well! BlackBerrys ship with a wall charger and a USB cable – which are both functional, but lack the ability to really support and charge the BlackBerry at the same time. I know I have knocked my BlackBerry off my desk more than once. 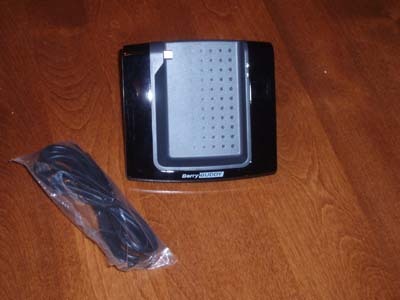 Enter Innov 8 Systems and their BerryBUDDY Cradle for BlackBerry Pearl 8100. Available from ShopCrackBerry.com, this sleek looking Cradle for the BlackBerry Pearl is stylish, functional and very well designed and made. It might just be the perfect solution to your BlackBerry Charging needs. The "Official" Word on the BerryBUDDY Cradle: The new BerryBuddy from Innov 8 Systems has been hailed as 'the new dawn in mobile phone technology'. The concept being to create a desktop cradle which compliments the smartphone in both form and functionality. This unique cradle is designed and manufactured to the very highest specification using an injection molded ABS construction and the very latest in electronic technology making it both light in weight and extremely robust. An elegant combination of flowing curves and clean lines and finished with a distinctive "jet black" coating. With USB connectivity, power and sync LED's and both PC and Mac compatible every last detail has been carefully considered to support the smartphone. The concept of the BerryBuddy is quite simple – to provide a secure place to both charge and connect your BlackBerry to your PC or Mac. The BerryBUDDY is made of a very solid feeling plastic with a “Piano Black Lacquer” finish. It is a reverse “V” shaped cradle. The BlackBerry sits nestled in the front of the charger. A mini USB plug is at just the right spot – so you just slide the charging port into the mini USB port on your BlackBerry. The BerryBUDDY is designed with two mini-USB ports underneath – one for attaching the included USB cable to the PC or Mac and one for attaching the AC power cord. In some ways, this seems like overkill since the BlackBerry can charge from the USB cable. There may be times, however, when you just want to charge the BlackBerry and not have it connected to the PC – so these two ports give you that option. It doesn’t get a whole lot easier than this device – just plug in the charger and/or USB cable and then slide in the Pearl into the charging port. The Pearl is held very securely in the charger and angled in a perfect way for the user to still be able to use the device. 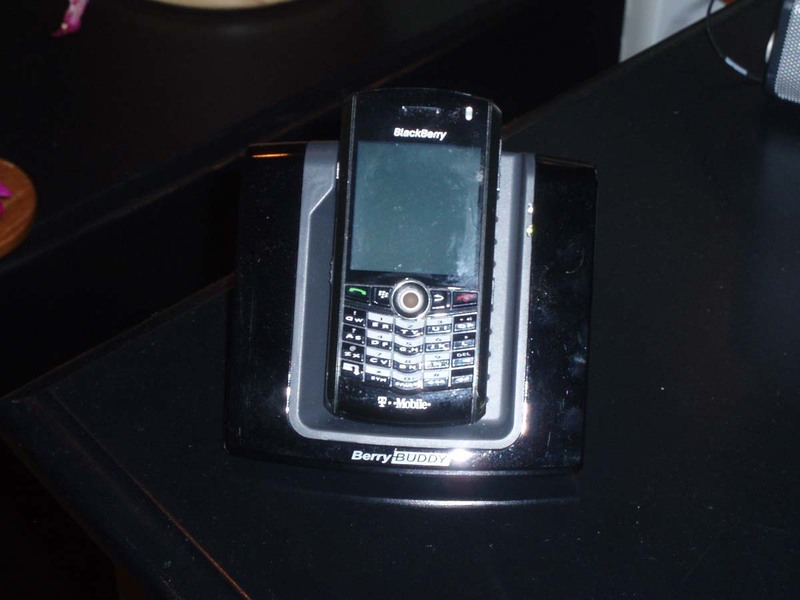 To remove the BlackBerry from the cradle, just slide it to the right and it comes right off. There are a couple of limitations of the BerryBUDDY that are important to point out. First, if you use a case for your BlackBerry, you will have to remove the BlackBerry from the case before charging. The fit is quite tight and there is no room for any extra bulk. That brings me to the second limitation; the BerryBUDDY cannot accommodate a BlackBerry using an extended battery. Since extended batteries protrude from the back, they device becomes too “thick” to slide into the charger. The BerryBUDDY from Innov 8 Systems is a great accessory to add to your current stable of BlackBerry goodies. 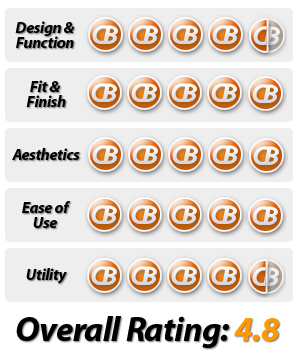 It is sleek, well made, functional and very simple to set up and use. As long as you don’t mind taking your BlackBerry out of its case and as long as you don’t use an extended life battery, this would be a great addition to any BlackBerry user’s desktop. 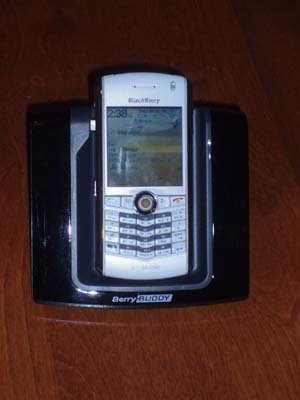 Purchase the BerryBUDDY for the BlackBerry Pearl 8100 from ShopCrackBerry.com.